“There is never any need to be hungry in Thailand”. On every street and around every corner there seems to be a food vendor. 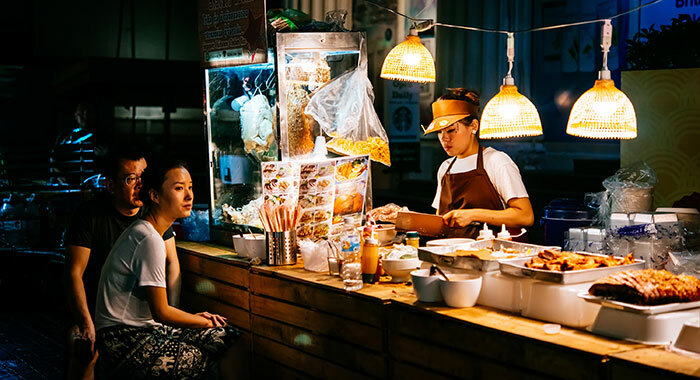 Whether it be savoury or a sweet treat the Thailand streets will fill your food cravings – we advise elasticated waists or additional notches on your belt! 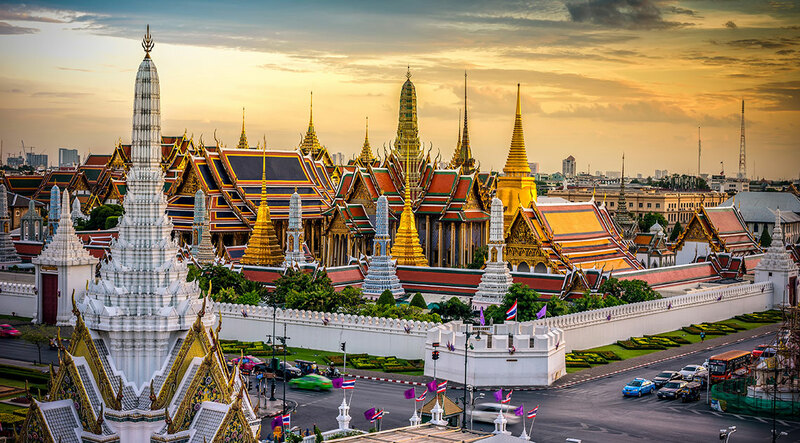 Bangkok was the most visited city in the world in 2018 with over 20 million people flocking to see her sights and experience Thai life. 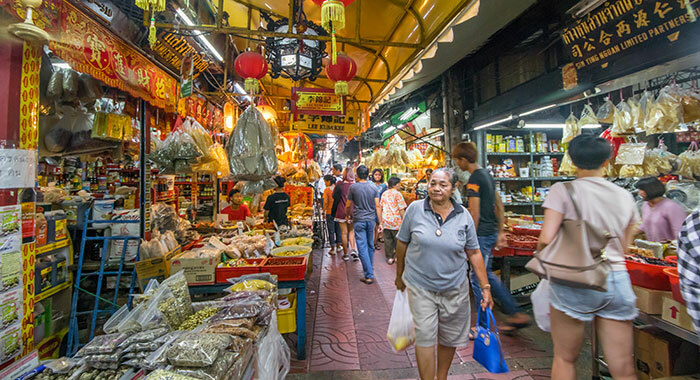 Street markets and food stalls serve dishes day and night to accommodate guests and we recommend you try the neighbourhoods of Chinatown and Old Town but there are many more for you to discover. To explore take the Old Town half day tour. Pick up from your hotel makes life easy. The tour includes transfer to Bangkok City Hall and a sight seeing stop at Wat Suthat, one of the oldest Buddhist temples in the city. Then it is walking all the way – down the side streets for ‘kafae boran’ (coffee), on to the small market where you can sample ‘khanom thua paep’ thin rice crepes and ‘gui chaii’ small dumplings. 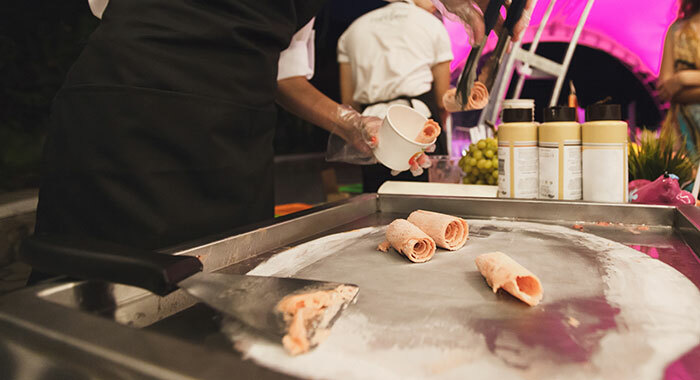 Food awaits on every stall from seafood and spices to sweet, creamy ice cream. Your guide will answer questions, guide you through the dishes and make some recommendations. Perfect! 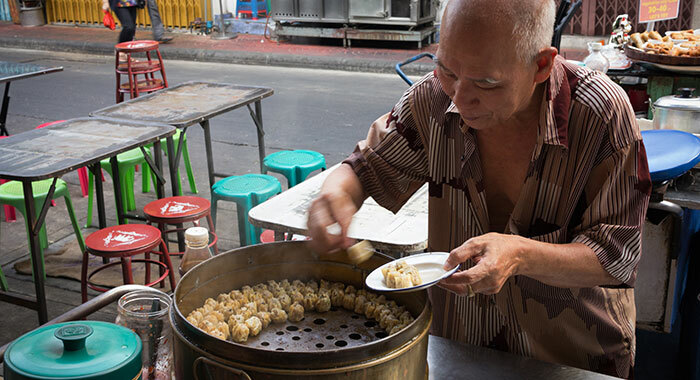 A full day Bangkok street food discovery tour includes breakfast at Bangrak Market, sweet treats a Tha Chang amulet market, Dim Sum in China town and Thai dishes at Sam Yan – a gourmet’s delight. For some real fun take a Food and tuk tuk tour in the evening. 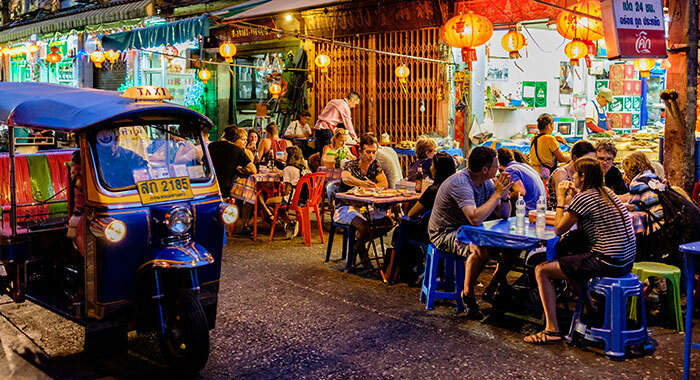 Whizz off with an experienced guide who will take you, by tuk tuk, to a diverse range of food stops where mystery is the theme. Sample regional delicacies and beer before finishing at Chinatown for desert. Going it alone, then Chinatown, known to the locals as Yaowarat, after the road it is situated on is a 15 minute walk from Hua Lamphong MRT station or a 5 minute walk from Rajchwongse Pier of the Chao Phraya River it is easy to find. Old Town or Banglamphu is a few minutes from the Talat Yot bus station or Chana Songkhram Pier and it is really popular for breakfast and lunch. 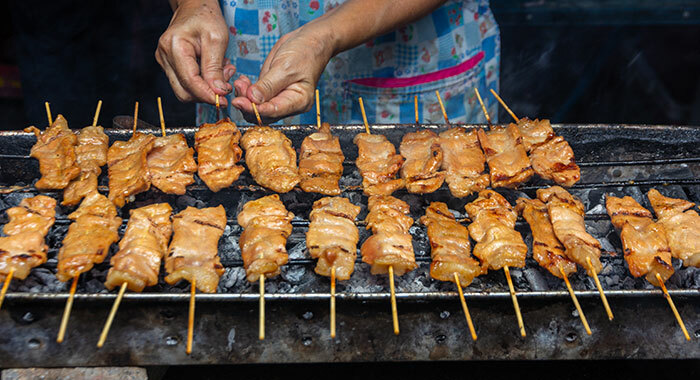 Try the satay meats, cooked over open flames and threaded on bamboo or for a little sweetness the lod chong Singapore – they look like little green snakes, but don’t be put off, they are delicious and vegan. For something different try the ducks foot wrapped in tongue “like nothing you have tasted before” advises one of Destinology’s Thai travellers. 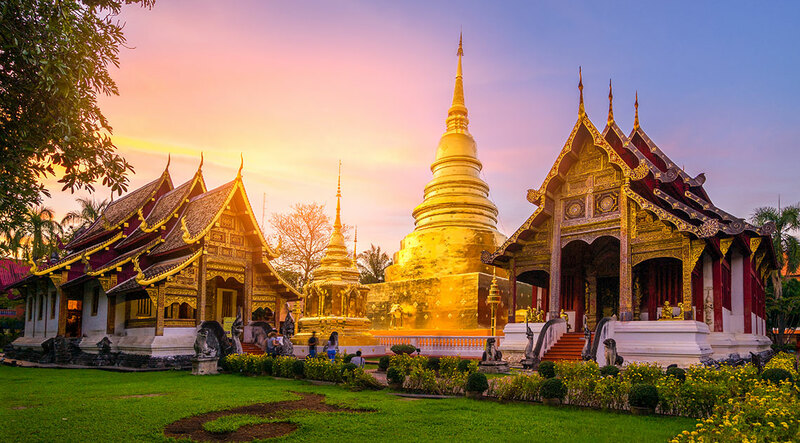 Situated in the northern, mountainous region of Thailand, Chiang Mai’s Old City is home to decorative Buddhist temples including Wat Phra Singh, built in 1345 and housing Phra Singh the Lion Buddha. In the surrounding area you can explore tribal mountain villages, national park forests and waterfalls and Doi Suthep which still embodies the Lanna culture which dates back nearly 700 years – it also has the Bhubing Palace, the Thai Royal Family’s holiday home. Street food vendors are literally everywhere you look in Chiang Mai but for choice head to Somphet Market there is food served here nearly 24 hours a day with stalls working almost in shifts and Chiang Mai Gate Market is a treasure trove of food from sunset. The Chiang Main Night Street Food tour begins at 18.30 and fulfils its promise of a lively night wandering through the street market. 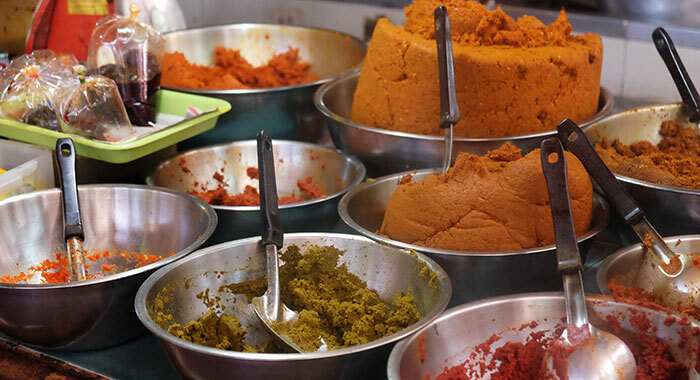 Your guide will introduce you to the local dishes on offer and make recommendations, but you can tuck into whatever catches your eye, lingers in your nose or tantalises your taste buds. 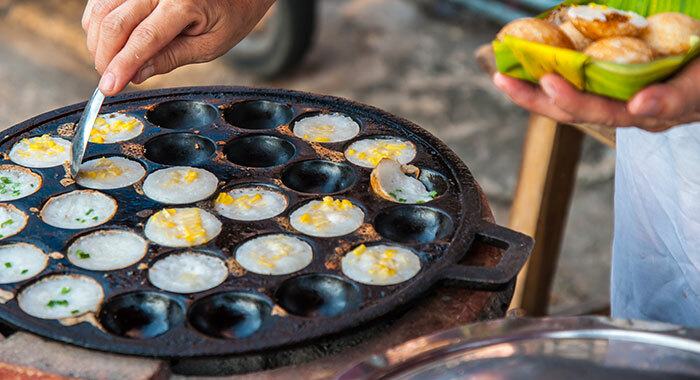 On offer are deep fried pancakes, kanom jeen (rice noodles with curry), pad Thai, and kanom krok a thai coconut pudding. There is also the local rice whisky to sample. Going it alone. You will stumble across quirky and individual restaurants often piled high with artwork, sculptures and all sorts of nick nacks so be prepared for a unique experience. Doing this Annie found “the best Massaman curry I have ever had so I went back the next night and ate it again.” Somphet Market changes as the day progresses, in the morning it is a great place for naem (hand rolled fermented pork), then later you will find fresh fruit, enticing ingredients and bbq foods (meat, seafood and vegetable. Later towards the evening noodle and roti stalls appear. 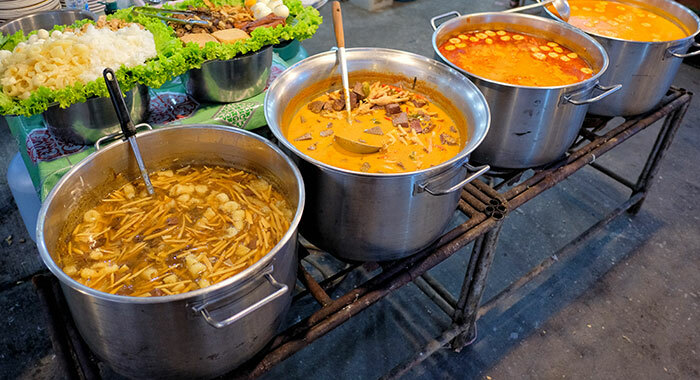 At Chiang Mai Gate settle at one of the small tables and take some time sampling dishes from a number of stalls – often they only serve one dish, but they are doyens at preparing and serving it. 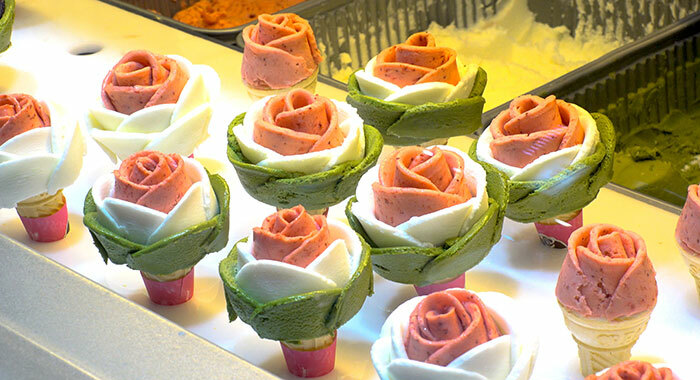 In the night bazaar you will find the ‘Facebook famous’ ice creams that gets carved & rolled to look like roses, now a locally renowned indulgence. One of the worlds finest beach destinations, Phuket is Thailand’s biggest island. Laze on the beach and explore please. 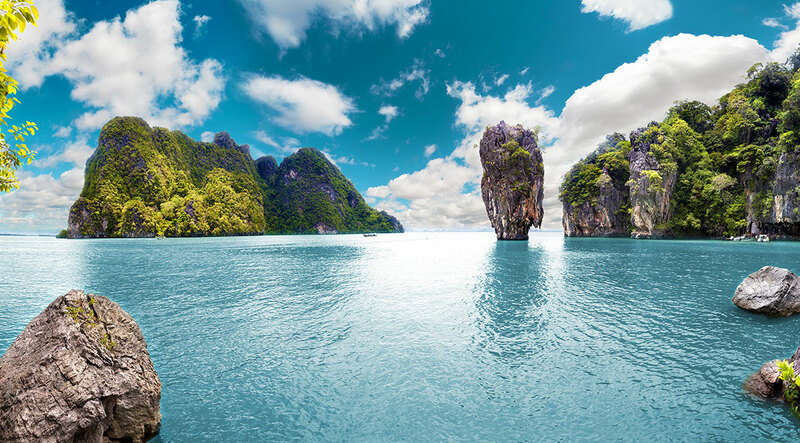 Phang Nga Bay is a must visit, the limestone cliffs dominate the area and jut vertically out of the water – think James Bond, Man with the Golden Gun as Koh Ta-pu was the iconic film location. The Big Buddha at Chalong is visible from most of the south of the island as it sits on top of the Nakkerd Hills overlooking the landscape and if Phuket is not enough to keep you busy then island hop to neighbouring Phi Phi, Similan or Racha islands. 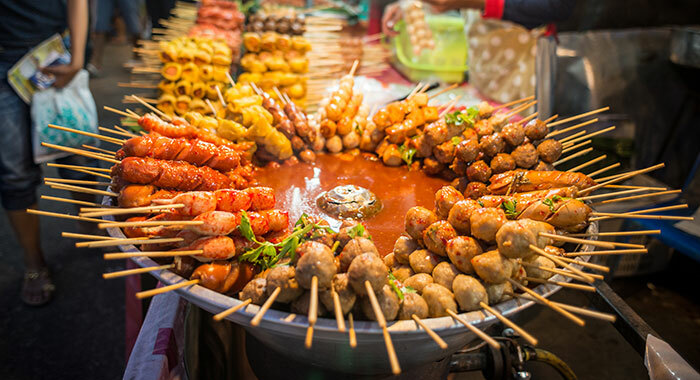 Street food in Phuket is fun and a great experience. Along the beach you can expect to find grilled sea food stalls, fresh fruit sellers and restaurants selling great value surf and turf; inland the markets capture the real soul of the local dishes and specialities include Moo Ping (pork satay), thai steamed dumplings with a multitude of fillings and Som Tum with grilled catfish which is “spicy deliciousness in a soup bowl” according to one Destinology traveller. 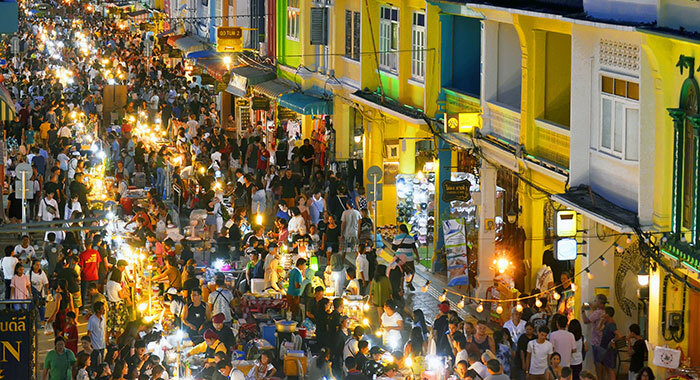 Must visit markets include Chillva, Phuket’s Old Town Walking Street Market and Malin Plaza in neighbouring Patong. 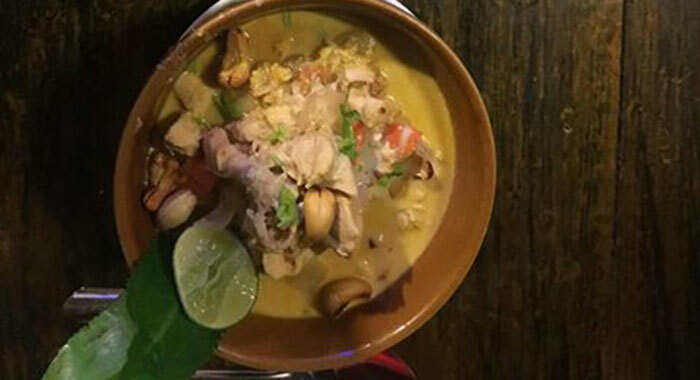 If you love food and fancy a bit of spice in the coming year then Thailand should be your pick from the world’s menu. Tour or explore the choice is yours. 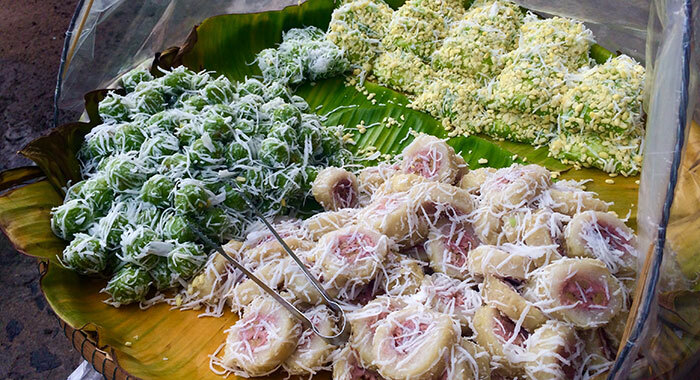 If Street Food tempts your taste buds read our article on fine dining.